Definition at line 520 of file util-unittest-helper.c. References TcpSession_::client, FAIL_IF_NULL, TcpStream_::isn, Flow_::protoctx, TcpStream_::sb, TcpStreamCnf_::sbcnf, SCCalloc, TcpSession_::server, stream_config, and STREAMING_BUFFER_INITIALIZER. Referenced by DetectPcrePayloadMatch(), and DetectUricontentRegister(). Definition at line 504 of file util-unittest-helper.c. References TcpSession_::client, FAIL_IF_NOT, FAIL_IF_NULL, TcpStream_::last_ack, Flow_::proto, Flow_::protoctx, TcpStream_::sb, TcpSession_::server, and StreamingBufferAppend(). Definition at line 652 of file util-unittest-helper.c. References DetectEngineAppendSig(), SC_ERR_INVALID_ARGUMENT, and SCLogError. Referenced by ActionInitConfig(), DetectBypassRegister(), DetectFlowintFree(), DetectSetupParseRegexes(), SCSigSignatureOrderingModuleCleanup(), TagTimeoutCheck(), and UTHGenericTest(). Definition at line 438 of file util-unittest-helper.c. References Packet_::flags, Packet_::flow, and PKT_HAS_FLOW. Definition at line 446 of file util-unittest-helper.c. References BUG_ON, FLOW_INITIALIZE, FLOW_IPV4, FLOW_IPV6, SCFree, SCMalloc, and unlikely. Referenced by AppLayerParserRestoreParserTable(), DetectEngineStateResetTxs(), DetectFlowintFree(), DetectPcrePayloadMatch(), DetectUricontentRegister(), HtpConfigRestoreBackup(), HTPFileClose(), and RegisterSMBParsers(). Definition at line 262 of file util-unittest-helper.c. Referenced by AlertFastLogInitCtx(), DetectAckRegister(), DetectAsn1Register(), DetectBase64DecodeDoMatch(), DetectBypassRegister(), DetectBytejumpDoMatch(), DetectBytetestDoMatch(), DetectDceIfaceRegister(), DetectDceOpnumRegister(), DetectDceStubDataRegister(), DetectDistanceRegister(), DetectDNP3Register(), DetectEngineInspectENIP(), DetectEngineInspectModbus(), DetectEngineInspectStream(), DetectEngineStateResetTxs(), DetectFastPatternRegister(), DetectFlowFree(), DetectFlowintFree(), DetectHttpRequestLineRegister(), DetectHttpResponseLineRegister(), DetectIcmpIdFree(), DetectIcmpSeqFree(), DetectICodeFree(), DetectIdFree(), DetectIPProtoRemoveAllSMs(), DetectIPRepFree(), DetectIsdataatFree(), DetectITypeFree(), DetectLuaRegister(), DetectPcrePayloadMatch(), DetectProtoContainsProto(), DetectRpcFree(), DetectSeqRegister(), DetectSshSoftwareVersionRegister(), DetectSshVersionRegister(), DetectSslStateRegister(), DetectSslVersionRegister(), DetectTemplateRustBufferRegister(), DetectTlsVersionRegister(), DetectTosRegister(), DetectUricontentRegister(), DetectUrilenValidateContent(), DetectWindowFree(), DetectWithinRegister(), IPOnlyAddSignature(), MpmACRegister(), MpmACTileRegister(), RegisterModbusParsers(), SCACBSPrintInfo(), SCSigSignatureOrderingModuleCleanup(), SCThresholdConfParseFile(), SMTPParserCleanup(), UTHBuildPacketOfFlows(), and UTHParseSignature(). UTHBuildPacketArrayFromEth is a wrapper that build a packets from an array of packets in ethernet rawbytes. Hint: It also share the flows. pktsize pointer to the array of sizes corresponding to each buffer pointed from pktsize. Definition at line 281 of file util-unittest-helper.c. References DecodeEthernet(), PacketGetFromAlloc(), SC_ERR_INVALID_ARGUMENT, SCFree, SCLogError, SCMalloc, and unlikely. Definition at line 319 of file util-unittest-helper.c. References DecodeEthernet(), PacketGetFromAlloc(), and unlikely. Referenced by DetectPortHashFree(), and DetectSetupParseRegexes(). Definition at line 81 of file util-unittest-helper.c. References Packet_::dp, Packet_::dst, Address_::family, Packet_::ip6h, PacketGetFromAlloc(), Packet_::payload, payload_len, Packet_::payload_len, Packet_::proto, SCFree, SCMalloc, SET_PKT_LEN, Packet_::sp, Packet_::src, Packet_::tcph, TimeGet(), Packet_::ts, and unlikely. Definition at line 361 of file util-unittest-helper.c. Definition at line 902 of file util-unittest-helper.c. References Packet_::dst, Packet_::flow, FlowHandlePacket(), FLOWLOCK_UNLOCK, SC_ATOMIC_RESET, Packet_::src, UTHBuildPacket(), and UTHFreePacket(). Referenced by FlowUpdateState(), TmModuleFlowRecyclerRegister(), and UTHParseSignature(). 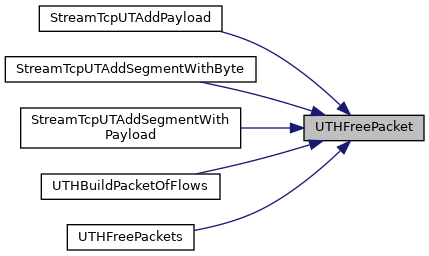 UTHBuildPacketReal is a function that create tcp/udp packets for unittests specifying ip and port sources and destinations. Definition at line 167 of file util-unittest-helper.c. References COPY_TIMESTAMP, GET_PKT_DATA, PacketCopyDataOffset(), PacketGetFromAlloc(), payload_len, SCFree, SET_PKT_LEN, TimeGet(), and unlikely. Referenced by ActionInitConfig(), DetectDetectionFilterRegister(), DetectDnsQueryRegister(), DetectThresholdRegister(), DetectTlsFingerprintRegister(), DetectTlsIssuerRegister(), DetectTlsJa3HashRegister(), DetectTlsJa3StringRegister(), DetectTlsSerialRegister(), DetectTlsSniRegister(), DetectTlsSubjectRegister(), DetectTlsValidityRegister(), SCThresholdConfParseFile(), StreamTcpUTAddPayload(), StreamTcpUTAddSegmentWithByte(), StreamTcpUTAddSegmentWithPayload(), TagTimeoutCheck(), UTHBuildPacket(), UTHBuildPacketSrcDst(), UTHBuildPacketSrcDstPorts(), and UTHParseSignature(). UTHBuildPacketSrcDst is a wrapper that build packets specifying IPs and defaulting ports. Definition at line 343 of file util-unittest-helper.c. Referenced by DetectFtpbounceRegister(), DetectGeoipRegister(), DetectSameipRegister(), IPOnlyAddSignature(), SCThresholdConfParseFile(), SigGroupHeadContainsSigId(), and UTHParseSignature(). UTHBuildPacketSrcDstPorts is a wrapper that build packets specifying src and dst ports and defaulting IPs. Definition at line 379 of file util-unittest-helper.c. results pointer to an array of numbers to check if sids matches that number of times or not. Definition at line 618 of file util-unittest-helper.c. References PacketAlertCheck(), res, SC_ERR_INVALID_ARGUMENT, SCLogError, and SCLogInfo. Referenced by DetectSetupParseRegexes(), SCSigSignatureOrderingModuleCleanup(), TagTimeoutCheck(), and UTHMatchPacketsWithResults(). Definition at line 497 of file util-unittest-helper.c. UTHFreePacket: function to release the allocated data from UTHBuildPacket and the packet itself. Definition at line 410 of file util-unittest-helper.c. References Packet_::ip4h, Packet_::proto, SCFree, Packet_::tcph, and Packet_::udph. Referenced by DetectBase64DecodeDoMatch(), DetectBypassRegister(), DetectBytejumpDoMatch(), DetectBytetestDoMatch(), DetectDistanceRegister(), DetectDNP3Register(), DetectDnsQueryRegister(), DetectEngineInspectENIP(), DetectEngineInspectModbus(), DetectEngineInspectStream(), DetectEngineStateResetTxs(), DetectFlowFree(), DetectFlowintFree(), DetectIPProtoRemoveAllSMs(), DetectIPRepFree(), DetectIsdataatFree(), DetectPcrePayloadMatch(), DetectTemplateRustBufferRegister(), DetectTlsFingerprintRegister(), DetectTlsIssuerRegister(), DetectTlsJa3HashRegister(), DetectTlsJa3StringRegister(), DetectTlsSerialRegister(), DetectTlsSniRegister(), DetectTlsSubjectRegister(), DetectTlsValidityRegister(), DetectWithinRegister(), SCThresholdConfParseFile(), StreamTcpUTAddPayload(), StreamTcpUTAddSegmentWithByte(), StreamTcpUTAddSegmentWithPayload(), UTHBuildPacketOfFlows(), UTHFreePackets(), and UTHParseSignature(). UTHFreePackets: function to release the allocated data from UTHBuildPacket and the packet itself. Definition at line 393 of file util-unittest-helper.c. Referenced by ActionInitConfig(), AlertFastLogInitCtx(), DetectAsn1Register(), DetectDceIfaceRegister(), DetectDceOpnumRegister(), DetectDceStubDataRegister(), DetectDetectionFilterRegister(), DetectFastPatternRegister(), DetectFtpbounceRegister(), DetectHttpRequestLineRegister(), DetectHttpResponseLineRegister(), DetectIcmpIdFree(), DetectIcmpSeqFree(), DetectICodeFree(), DetectIdFree(), DetectIsdataatFree(), DetectITypeFree(), DetectLuaRegister(), DetectPcrePayloadMatch(), DetectProtoContainsProto(), DetectRpcFree(), DetectSeqRegister(), DetectSshSoftwareVersionRegister(), DetectSshVersionRegister(), DetectSslStateRegister(), DetectSslVersionRegister(), DetectThresholdRegister(), DetectTlsVersionRegister(), DetectTosRegister(), DetectUricontentRegister(), DetectUrilenValidateContent(), DetectWindowFree(), IPOnlyAddSignature(), MpmACRegister(), MpmACTileRegister(), RegisterModbusParsers(), SCACBSPrintInfo(), SigGroupHeadContainsSigId(), SMTPParserCleanup(), and TagTimeoutCheck(). UTHGenericTest: function that perfom a generic check taking care of as maximum common unittest elements as possible. It will create a detection engine, append an array of signatures an check the spected results for each of them, it check matches for an array of packets. Definition at line 575 of file util-unittest-helper.c. References DE_QUIET, DetectEngineCtxFree(), DetectEngineCtxInit(), DetectEngineCtx_::flags, SC_ERR_INVALID_ARGUMENT, SCLogError, SigCleanSignatures(), SigGroupCleanup(), UTHAppendSigs(), and UTHMatchPacketsWithResults(). Referenced by DetectAsn1Register(), DetectIdFree(), DetectIPProtoRemoveAllSMs(), DetectIsdataatFree(), DetectSeqRegister(), DetectTosRegister(), DetectWindowFree(), IPOnlyAddSignature(), and TagTimeoutCheck(). Definition at line 741 of file util-unittest-helper.c. References DetectEngineThreadCtxDeinit(), DetectEngineThreadCtxInit(), SC_ERR_INVALID_ARGUMENT, SCLogError, SCSigOrderSignatures(), SCSigRegisterSignatureOrderingFuncs(), SCSigSignatureOrderingModuleCleanup(), SigGroupBuild(), SigGroupCleanup(), and SigMatchSignatures(). Referenced by DetectSetupParseRegexes(), and SCSigSignatureOrderingModuleCleanup(). Definition at line 691 of file util-unittest-helper.c. References DetectEngineThreadCtxDeinit(), DetectEngineThreadCtxInit(), SC_ERR_INVALID_ARGUMENT, SCLogError, SigGroupBuild(), SigMatchSignatures(), and UTHCheckPacketMatchResults(). Referenced by ActionInitConfig(), and UTHGenericTest(). Definition at line 853 of file util-unittest-helper.c. 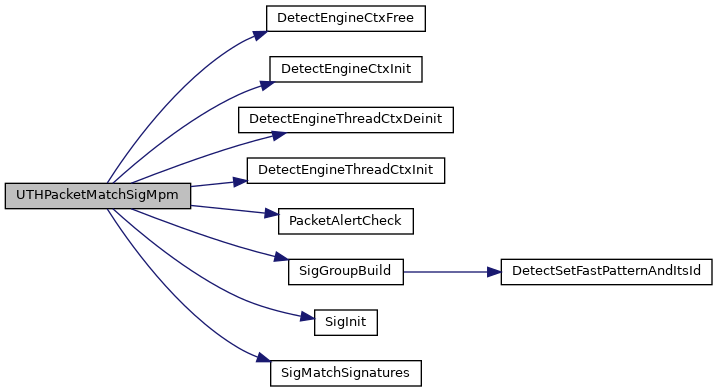 References DE_QUIET, DetectEngineCtxFree(), DetectEngineCtxInit(), DetectEngineThreadCtxDeinit(), DetectEngineThreadCtxInit(), DetectEngineCtx_::flags, Signature_::id, PacketAlertCheck(), DetectEngineCtx_::sig_list, SigCleanSignatures(), SigGroupBuild(), SigGroupCleanup(), SigInit(), and SigMatchSignatures(). Referenced by DetectBytejumpDoMatch(), DetectBytetestDoMatch(), DetectDistanceRegister(), DetectIsdataatFree(), DetectPcrePayloadMatch(), DetectPortHashFree(), and DetectWithinRegister(). Definition at line 792 of file util-unittest-helper.c. References DE_QUIET, DetectEngineCtxFree(), DetectEngineCtxInit(), DetectEngineThreadCtxDeinit(), DetectEngineThreadCtxInit(), DetectEngineCtx_::flags, Signature_::id, DetectEngineCtx_::mpm_matcher, PacketAlertCheck(), SCEnter, SCReturnInt, DetectEngineCtx_::sig_list, SigCleanSignatures(), SigGroupBuild(), SigGroupCleanup(), SigInit(), and SigMatchSignatures(). Definition at line 929 of file util-unittest-helper.c. References DE_QUIET, DetectEngineAppendSig(), DetectEngineCtxFree(), DetectEngineCtxInit(), Packet_::dst, FAIL_IF_NOT_NULL, FAIL_IF_NULL, Address_::family, DetectEngineCtx_::flags, FLOW_QUIET, flow_spare_q, FlowInitConfig(), FlowShutdown(), FlowQueue_::len, len, PASS, Packet_::payload, Packet_::payload_len, Packet_::proto, SCNtohs, Packet_::src, Packet_::tcph, Packet_::udph, UTHBuildPacket(), UTHBuildPacketOfFlows(), UTHBuildPacketReal(), UTHBuildPacketSrcDst(), UTHBuildPacketSrcDstPorts(), and UTHFreePacket(). Definition at line 1147 of file util-unittest-helper.c. Definition at line 540 of file util-unittest-helper.c. References FAIL_IF_NOT, FAIL_IF_NULL, Flow_::proto, Flow_::protoctx, SCFree, and StreamTcpSessionCleanup(). Definition at line 57 of file util-unittest-helper.c. Referenced by DetectIPRepFree(), and ICMPv4GetCounterpart().